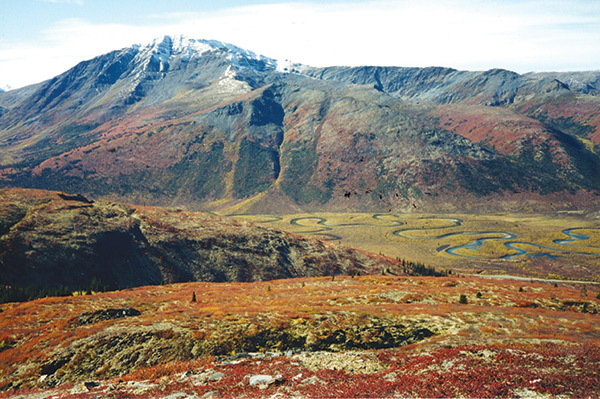 Our new trapline was located in the Yukon’s rugged Logan Mountains. As I strapped on my pair of “misery slippers” for the umpteenth time, I muttered to myself, “Another lesson learned the hard way.” With 40 miles of trapline trail to break open, I faced some tough sledding—literally. This time, my mistake had been letting the snow build up before putting in trails. Had I started right after the first snowfall, as I had been told, I would have had a good base to work from, and I might have been setting marten traps instead of strapping on snowshoes at every little hill. But after a successful week of open-water trapping, I got cocky. Instead of taking the good advice I had been given, I decided to wait a few days before opening up the land trails. Then heavy snow fell for three days straight. By the time the storm passed, every trail in the Hyland River Valley was buried. As I fought for every mile of trail, I found myself trying to remember everything else Ernie Leach had told us about this country. My wife and I had bought trapline No. 254 from Ernie the previous summer, looking forward to spending our first full season on a wilderness trapline. A grizzled old-timer, Ernie had spent most of his life trapping remote lines in the far North. He had given us a lot of good advice that would prove invaluable in the months to come. After that early snowfall plugged the trails, I found myself wondering what Ernie would do anytime anything went wrong. Should you be lucky enough to find your own grizzled old-timer, listen well, and heed his advice. Unlike some of the people who head north to trap, we didn’t have any romantic notions about what life in the bush would be like. For us, it wasn’t anything new as we already had made a living in the Northwoods for many years. What was new, however, was this particular environment. Our new trapline was located in the Yukon’s rugged Logan Mountains. Most of the valleys were open willow flats, with little protection from the wind. Get in trouble out here, and you might not be able to find wood for a fire. But the first challenge was getting a winter food supply and trapping gear into our new home. Nearly 300 miles of rough gravel road had to be driven, the last 150 miles only passable during the short summer. Even then, countless mud holes and swift mountain streams had to be crossed. Two trips over that goat trail were required to haul in all of the food and gear we would need for a family of five. The cabin was small for our family of five. The cabin was small. My wife Reggie measured 3 feet of counter space for her kitchen, half of which was occupied by a two-burner propane stove. A wood heater in one corner and a set of bunk beds took up most of the rest of the living space. Water came from a small creek via bucket, and an old Spillsbury SBX-11 radio provided sporadic contact with the outside world. September 20, a local outfitter took our truck out for the last time. We saw him again in late October when he came in with some late-season caribou hunters. But other than that, we did not see another human for five months. My first job was to get in a winter’s wood supply, not an easy job in country with few trees. Reggie kept busy home schooling our three kids. Her goal was to have them far enough ahead they could spend a few weeks out on the line during the peak of trapping season. I rigged an old two-wheel-drive ATV to haul the firewood. But the willows were so thick I had to walk ahead with a machete just to get the bike to the timber. Once we had the wood in, we took a few days to pick berries and explore our new home. The mountainsides were loaded with blueberries, and up higher, moss berries. The bears knew this, too, as rarely did a day go by without one of us seeing a bear. When the weather started to cool, we kept our eyes peeled for game animals. The mountains around our cabin were summer range for the Nahanni caribou herd. But by late fall, they would migrate north to their winter range in the Northwest Territories. Ernie told us about this migration and advised me to get our meat early. I took his advice and located a big bull in late September. The fellow had a harem of cows stashed up high in a basin, and it was going to be a long, tough climb to reach them. I just hoped they stayed put long enough for me to get a shot. A light breeze stayed in my favor, and I found enough cover to get within range of the old .32 rifle. One shot later, we had our meat. With firewood and meat taken care of, I started sorting traps. 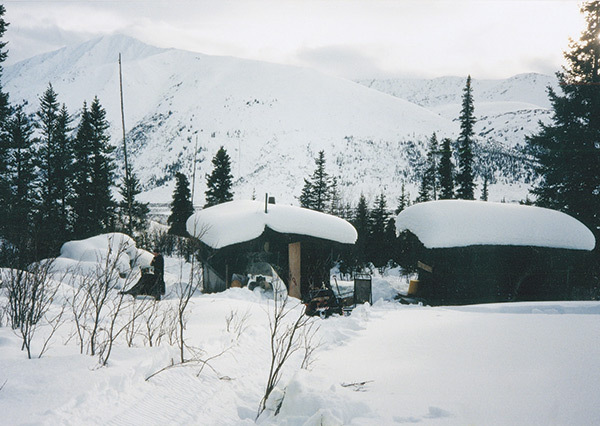 Trapline #254, O’Farrell family home for their first full winter in the Yukon wilderness. The Little Hyland River runs just below the cabin and is home to an incredible beaver population. But the season didn’t open until October 1, and Ernie had warned us that we could expect the river to freeze within a week of that. I figured I had maybe seven days, so I planned to put out a lot of steel. The goal was to harvest 40 beavers before the river froze. Opening morning dawned clear and cold. Since the river paralleled an old mining road, my wife took me a few miles upriver on the bike and then dropped me off. I would float back downstream in a stashed canoe, setting traps all the way. By noon, I had counted 33 active beaver houses and put entrance sets in 15 of them. Three hours later, I had another 10 traps set and a light snow was falling. Early the next morning, I was back out on the river. Four inches of wet, heavy snow had fallen overnight. The temperature also had fallen, and the river was beginning to run ice. Large pans jostled the canoe as I made my way downstream. I had to work twice as hard to maneuver through this ice, and it got worse as the weight of the catch piled up. I could feel the canoe wallow as I nosed into a small eddy below my last set. The combination of 22 beaver carcasses amidships and 3 inches of cold water sloshing around my ankles had robbed the small craft of its gracefulness. I managed to check every trap two more times before the river froze completely. I put in some long days, and it paid off with 43 beavers and two otters. Even though trapping seasons may be long in the North Country, time is always in short supply. Miss a few days, and it can be impossible to catch back up. Weather is the biggest obstacle. During severe cold snaps the fur doesn’t move much, and up here, you can count on two or three snaps each winter. Sometimes they last a few days; sometimes they last for weeks—but they always come. Heavy snowfall and blizzards can also keep a trapper anchored in his cabin for days on end. Once the storms pass, you are left with miles of trail that must be reopened. Buried traps must be dug out and reset. All of this can really take a toll on the overall catch and the fur check at the end of the season. We got lucky that first season. After the first big snow, the rest of the winter was relatively mild. Once I got the trails opened and the traps out, things ran rather smoothly. We finished the season with 65 marten, seven wolverines, those 43 beavers and two otters. Like trappers everywhere, our schedule revolved around the fur auctions. We needed to be home no later than March 10 to get our fur shipped in time for the last big sale of the year. With mixed emotions, we left our little cabin on the morning of March 5. We were anxious to see family and friends, but at the same time, we had enjoyed life on the line. 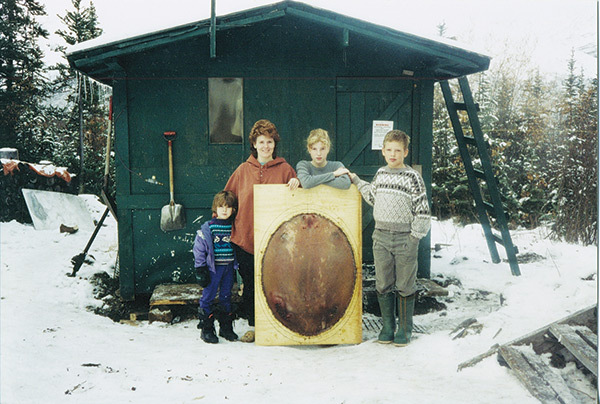 Two decades have passed since that season, and we have been lucky enough to spend most of those years in the Yukon bush. Although we no longer own trapline No. 254, lessons learned there have made each subsequent season easier. We realized, early on, that if trapping was going to be a big part of our lives, we had to consider the bottom line. That meant running a line that produced good numbers of either marten or lynx, the bread and butter furbearers for northern trappers. Since the two species prefer different habitat, few traplines hold both in large numbers. Traplines that produce high numbers of marten typically produce few lynx, and vice versa. But some of the better marten lines produce 150 to 250 every year, and a good lynx line can easily yield 50 to 80 cats. New trappers who count on income from fur are well advised to seek areas where one of these two species is abundant. 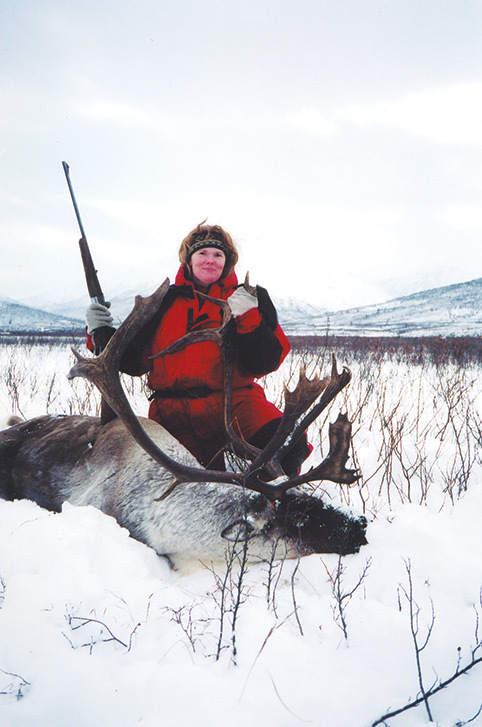 While shopping for the family’s winter meat, Reggie O’Farrell decided to take this nice bull caribou. Access is another consideration. Consider the costs before buying a trapline that can be accessed only by air. Bush plane pilots typically charge anywhere from $4 to $10 a mile, depending on the size of their plane. A better option is to find a profitable trapline that can be reached by truck, snowmachine, or ATV. Running that trapline will be much different than trapping the roads down south. When something breaks, you will be on your own. Your livelihood, and sometimes your life, may depend on being able to fix broken equipment. A good set of tools and plenty of spare parts are both a must. A full medical kit and some advanced first-aid training are also needed where a minor wound can become life-threatening if it isn’t handled properly. A few years ago a trapper up on the Yukon River cut his thumb with an axe. He just bandaged it up and kept going. A few days later, he started running a high fever and not feeling well. By the time he got to town, the thumb was so infected the doctors couldn’t save it. Yet they told him he was lucky to lose only a thumb. Had the blood poisoning gone septic, it could have killed him. Living in the bush for months at a time is nothing like a reality show on TV. To do it successfully takes careful planning and a lot of hard work. But those who are willing to endure the hardships may find freedom and never-ending adventure.